Exhibit reception moved to April 25th. We are in the process of digitizing our archives collection. Currently there are over 5,950 items available in our digital archives catalogue including photographs, postcards, maps, documents, oral histories and other items. Many thanks to Daniela, our staff archivist, and Herb Thomas, a faithful library volunteer. 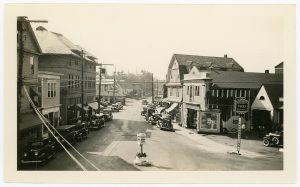 Pictured: A photograph of Main Street, Northeast Harbor, taken in the 1930's, the Herrick House has been replaced by Brown's Taxi shown at below.